We love art at our house but I found that we didn’t get much art done this year with a baby and a toddler. 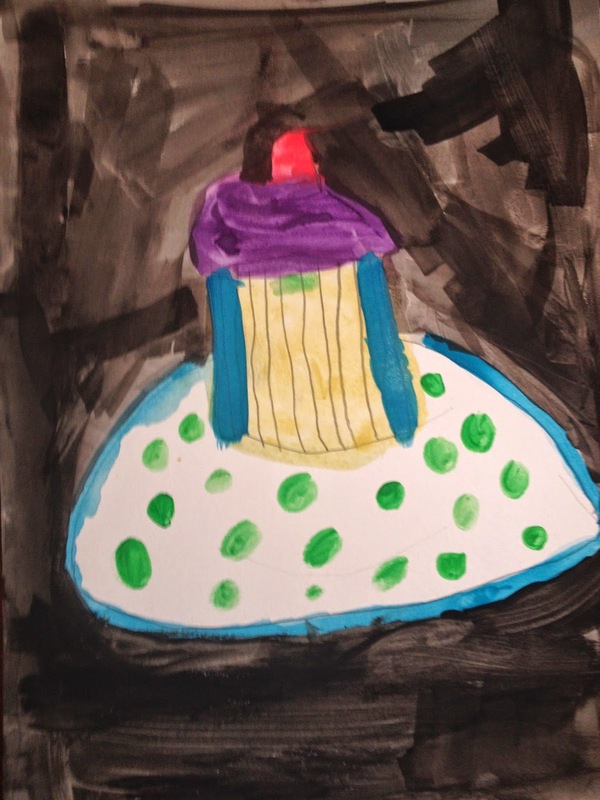 I looked for resources to help us make time for art which is why I was thrilled to review the Early Elementary K-3, Book 3: Modern Painting and Sculpture from ARTistic Pursuits. Now we had a plan for doing some art projects! 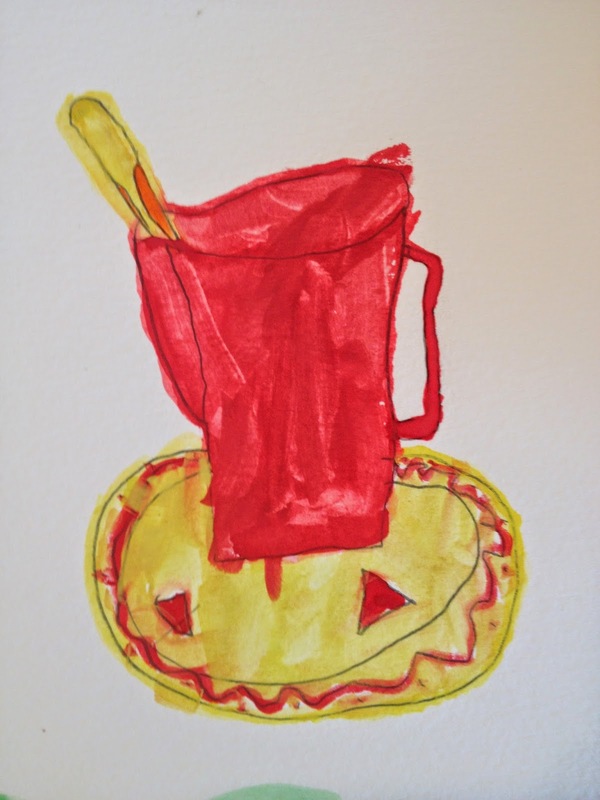 ARTistic Pursuits is a homeschool art program designed to give student’s hands-on experience with art while also increasing their observation skills through the study of artwork. The various lessons provide information on artists, art movements and time periods, and famous works of art. The student reads the historical information, observes works of art, and follows the instructions to create art using various techniques. 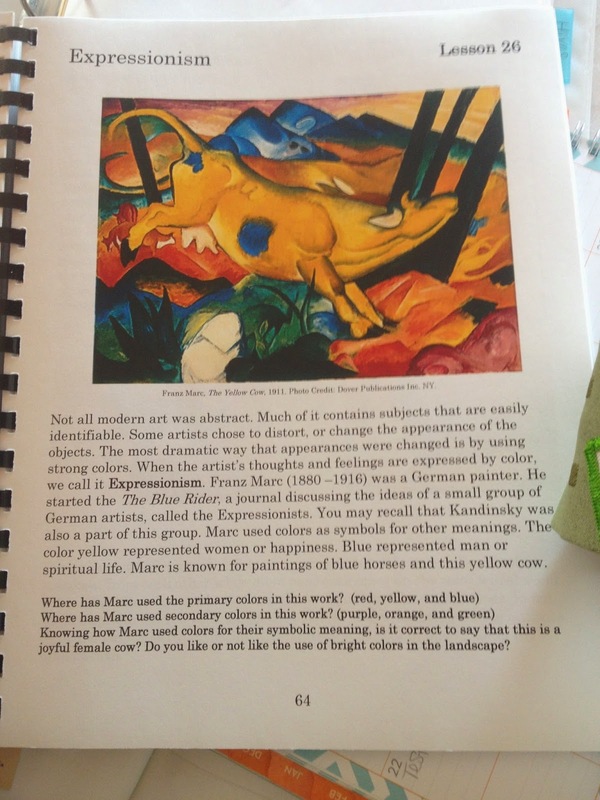 Early Elementary K-3, Book 3: Modern Painting and Sculpture contains 36 lessons of art history, artist study, and observation of modern art and sculptures. 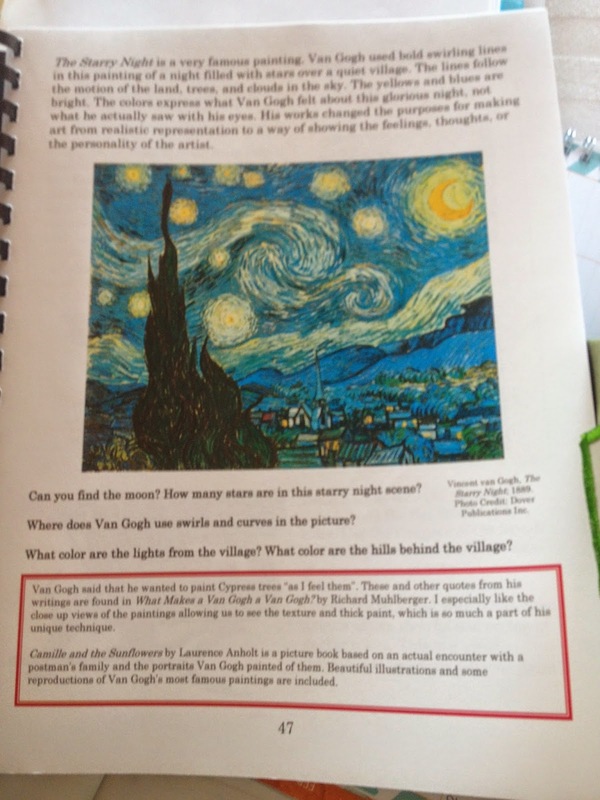 The lessons introduce the student to different works of modern art while containing questions to engage the student in critical observation and practice thinking skills. 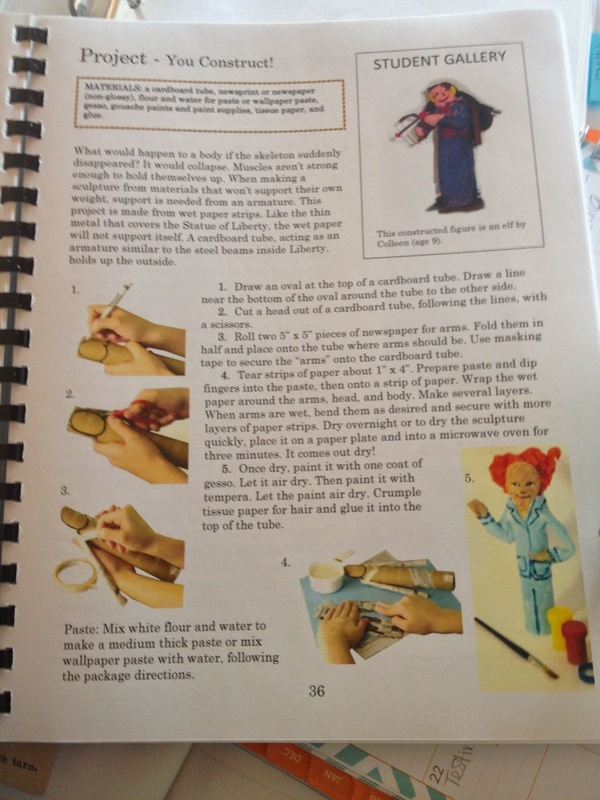 Each lesson has an art activity for the child to create using a technique in sculpting, painting, or other techniques such as collage and stamping. The project is described in a step-by-step method with clear instructions and also includes a sample of a finished project by a student in the elementary age range. 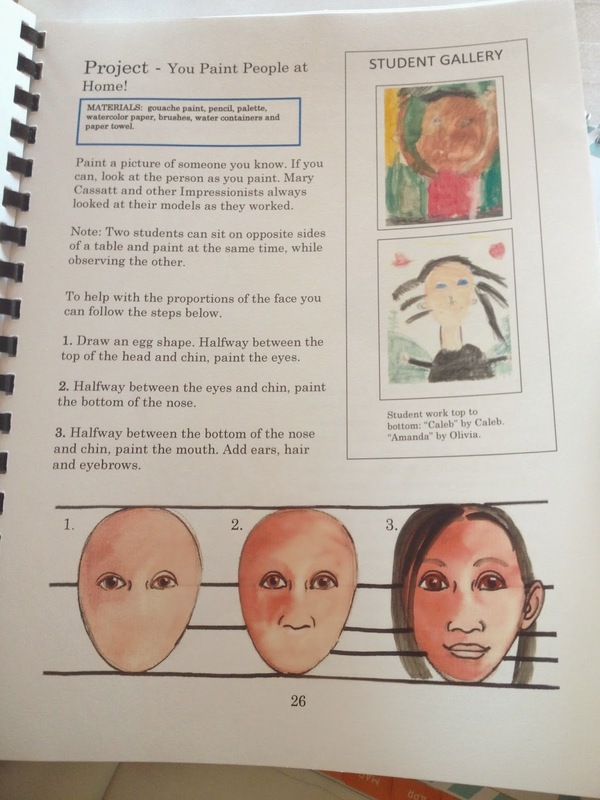 This book is geared for students ages 5 and up, but is mostly designed to be used with early elementary aged students in grades 3 or below (although older students with little art experience would enjoy the book as well). The lessons in the book are intended to be done at a rate of 1 lesson per week. 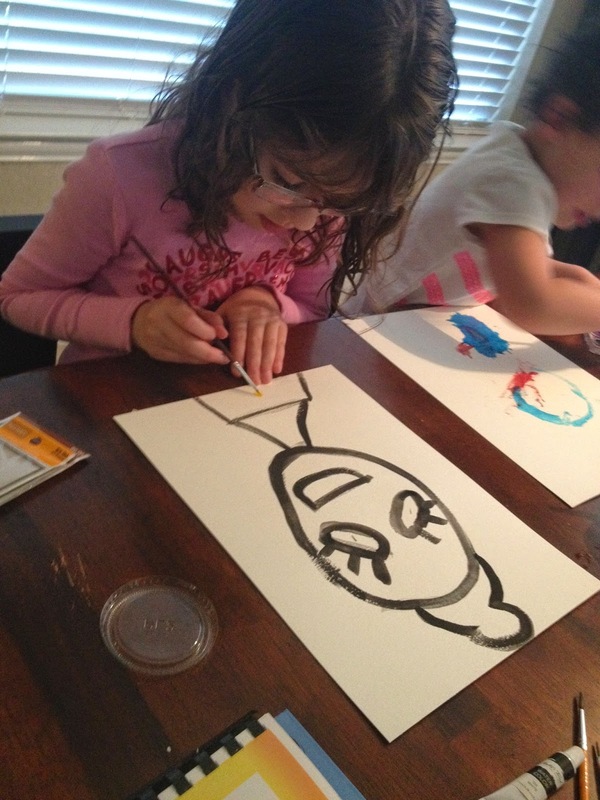 My kids were quite excited to work on art again so we often completed 3 lessons per week. We were able to complete 1 lesson per day on the days that we did art lessons. 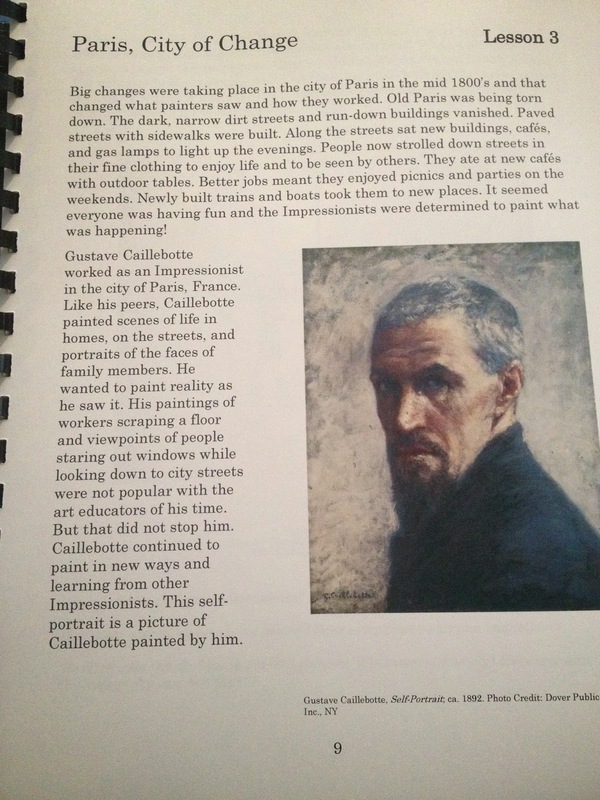 I began the lessons by reading the text to my kids and we discussed the artist, the work of art, or I asked them a series of questions as they observed a famous piece of art that was reproduced in the text. After our brief art lesson and discussion (10 minutes max), I showed them the project for the day. I read the instructions and we talked about the completed sample picture in the text. We reviewed the techniques that were introduced in the text and talked about the steps they would need to follow in order to complete their project. Then I got out the supplies for the day and my kids worked on their art projects independently while I read literature books aloud to them. After a few lessons in the book, Curly (age 8) became my only art student as my PreK daughter and K’er son opted to play outside. Curly often spent 30 or more minutes on her paintings and projects and she was very proud of her work. What did a lesson look like? This lesson introduced the the art of studying an object by looking at it from various angles. The text discussed Monet and how he studied his subject at various times of day or in various weather conditions. The lesson taught us that Monet painted quickly and without the minute details of previous artists because he was trying to capture his subject before the light changed drastically or the weather changed. Monet was the first to introduce the Impressionist style of painting with loose brushstrokes in bright colors. The next page of the lesson was titled New Ways of Seeing an Old Cathedral. 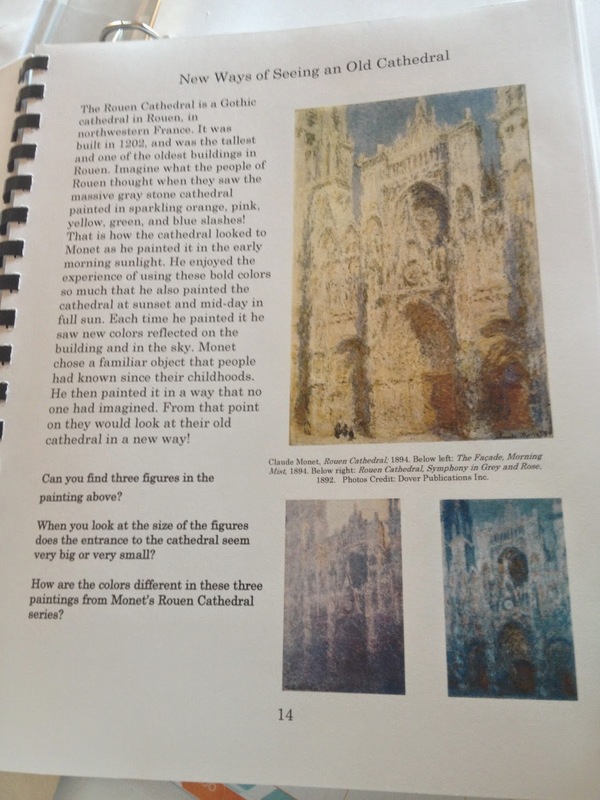 The text contained 3 pictures of the Rouen Cathedral in France with a description and background of the cathedral. Monet painted 3 pictures of this cathedral with each being a view of the cathedral in different light – one in the early morning sunlight, one at sunset, and one at midday in full sun. After looking at the cathedral pictures and comparing the shadows and colors, I asked Curly the discussion questions in the text. The last portion of the lesson was the project which was to make a series of paintings. The lesson was to paint an outdoor object at different seasons or in different weather. Curly chose to paint the tree in our backyard in 3 different seasons. 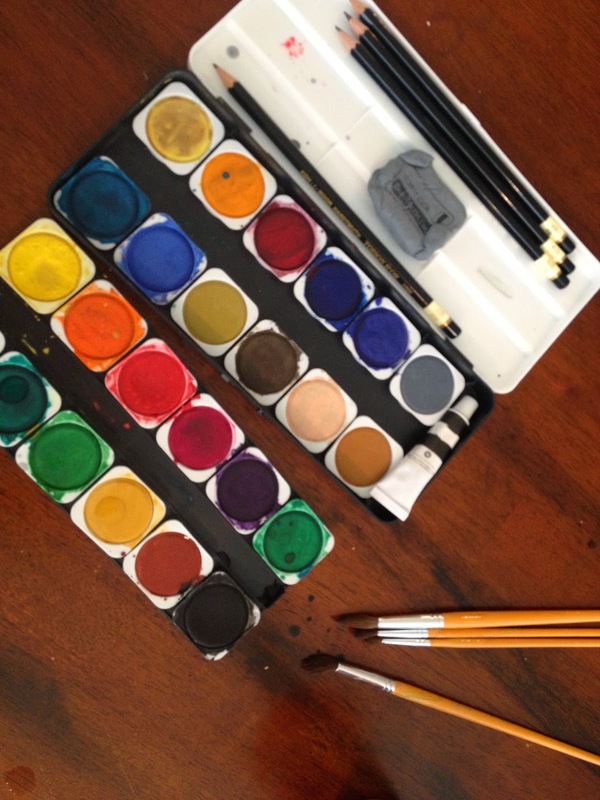 The lesson provided tips for layering water colors – you can layer a dark color over a light color or layer a light color on top of a darker one as long as the paint is dry. My favorite aspect of this art program is that is is doable. It is not overwhelmingly complicated, the supplies are easy to obtain, the projects are clearly explained, the techniques are illustrated in pictures in the text, and the works of art for observation are printed directly in the book. All the artwork, instructions, and text are in the book. You only need to collect the simple supplies such as water color paints, clay, and some household objects that cardboard and tin foil. Each day I only needed to open the book, read the lesson, explain the steps, and my daughter was able to get started on her project without my help. She could then work on her own to finish the project at her pace. We were doing an art lesson 3 times per week and loving every minute of it! The program is more than just art projects – there are short biographies on various artists and descriptions of artistic movements and time periods. 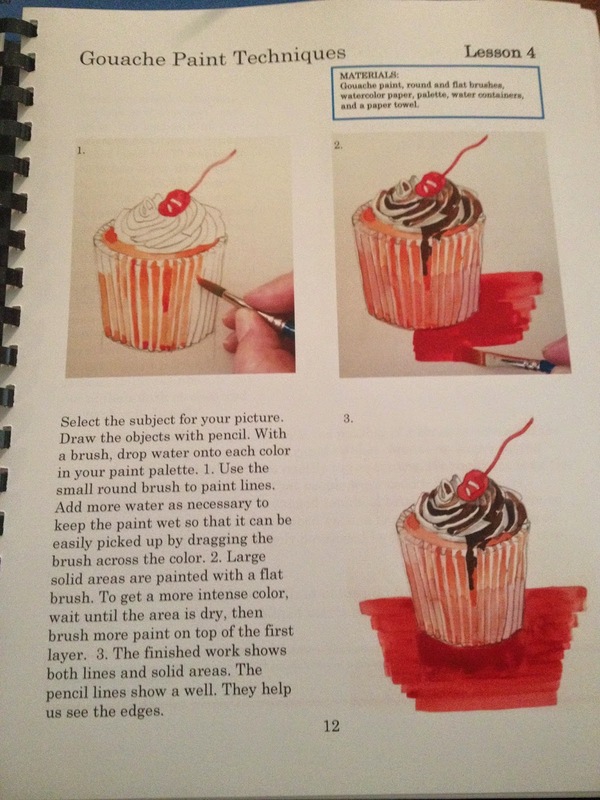 The lesson instructions introduce techniques such as how to create different sizes of brushstrokes, outlining a shape before painting, and creating layers of colors and paint. I appreciate the different tips and instructions from how to mix colors to which brush size to use for various projects. My kids especially enjoyed the pages where they were to observe a picture and I asked them questions about it such as, “Can you find all the black areas in the painting?” or “Where has the artist used secondary colors in the painting?” or “How does the artist show that it is a sunny day?” They loved searching the picture for various types of techniques and colors used as well as trying to describe what the people in the picture were doing or thinking. We found the instructions for the various projects to be clear and easy to understand. But what we found especially helpful were all the pictures of actual artwork by other students of similar ages. Seeing the picture in the “student gallery” gave my kids ideas of what to create and helped them visualize the completed project. This enabled them to work on the project without as much help from me since they had a vision of what they were creating. Of course, none of our pictures looked like the works in the book as they were each unique and individual to each of my children. One note to mention was that there were a few pages that must not have printed correctly in my book. I found a couple pages that were missing the rest of a sentence at the bottom of a page or even in the middle of the page. I’m assuming that this must be a printing error. So, it was frustrating to come to a page that had a sentence that left us hanging without a resolution. This book contained water color projects, sculpture projects using a wide variety of materials, collage projects and stamping projects, paper weaving, and carving. We found the variety to be fun and the projects to be age appropriate for kids in the elementary ages. 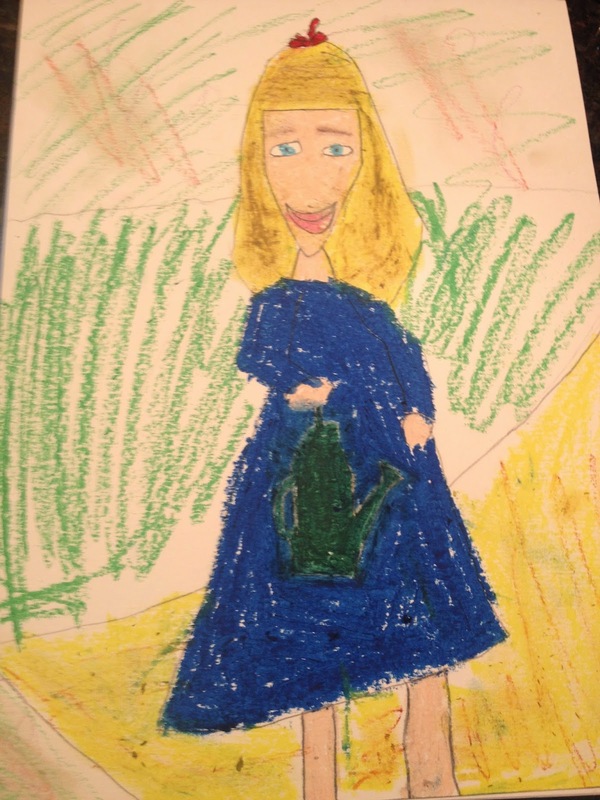 We love this art program because it has a wide variety of topics taught, materials used, techniques introduced, and it is easy to implement in a homeschool setting. This program has finally allowed us to add art back into our day without much planning and prep time for me. 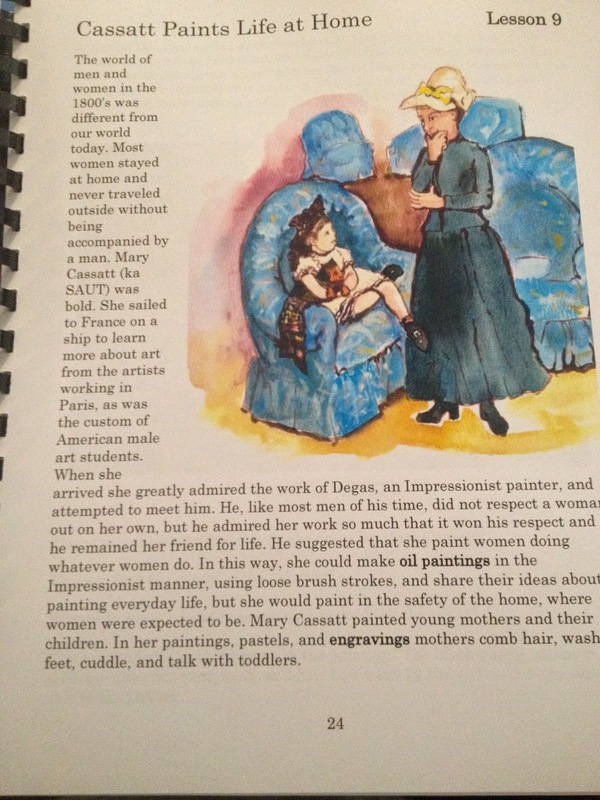 We love the art history and observation that is introduced in the book. And the projects that my children have completed are treasured pieces of art that we have hung all around our house. This is such a well-rounded and fun art program that we are excited to continue using it throughout the summer!